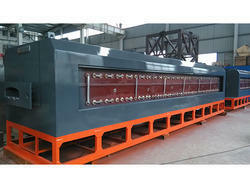 We are the leading manufacturer and trader of Mesh Belt furnace for Sintering. Our organization is positioned as the perceived manufacturer and exporter of subjective Mesh Belt Furnace For Sintering. The offered cluster is precisely made by gifted industry specialists using choice quality crude material in complete consistence with the set worldwide standards. This item discovers application in different commercial enterprises for arranged capacities. Aside from this, we have a gifted group of value evaluators, who unequivocally check the nature of every item to ensure flawlessness.